I am very lucky to live extremely close to my office – not only do I have a super short commute on rainy days like today but I also occasionally go home for lunch. Although I definitely don’t recommend going home every day (it screws with your work-home balance) it can be a really nice break on days where the work-load allows. On the days where I do run home, occasionally I’ll take advantage and step up my standard boring lunch-fare. Today I changed up my ham and Swiss wrap by throwing it into a pan, changing it into a faux-quesadilla! 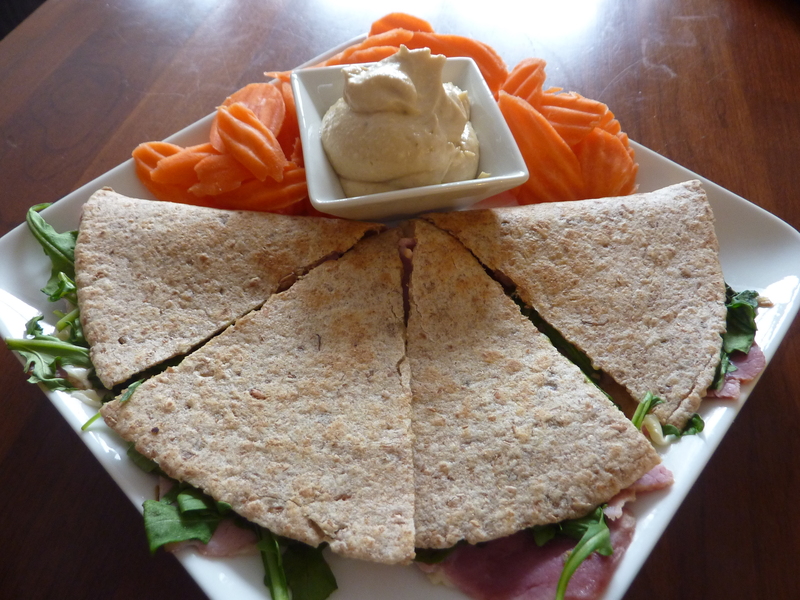 The “quesadilla” is nothing more than 1 multi-grain tortilla, rosemary ham, Swiss cheese, arugula and honey mustard warmed in a non-stick fry pan (no oil or butter needed). Served with a side of Sabra hummus and carrot chips it was a delightful step up! This entry was posted in Culinary Adventures and tagged easy, Ham, Lunch, recipe, Wrap. Bookmark the permalink.